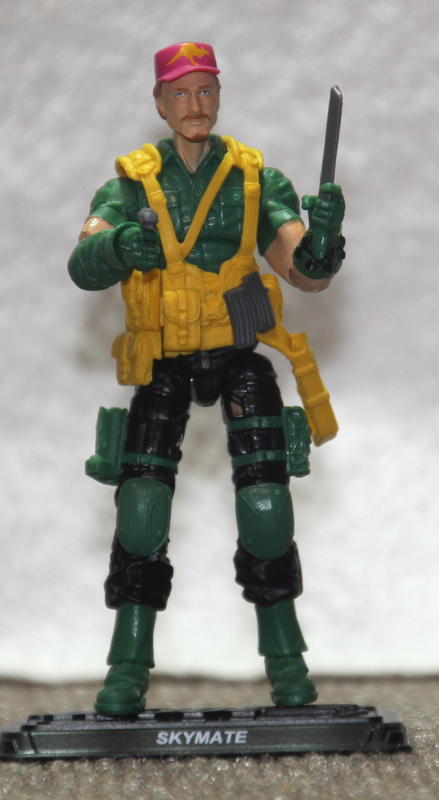 While I may not have had the Air Commandos figures growing up, I’ve always been fascinated by obscure Joes, and that definitely describes that particular subset. Personally, I always liked Skymate the best, so when I saw that he was a souvenir figure at Joe Con 2016, I was really excited. 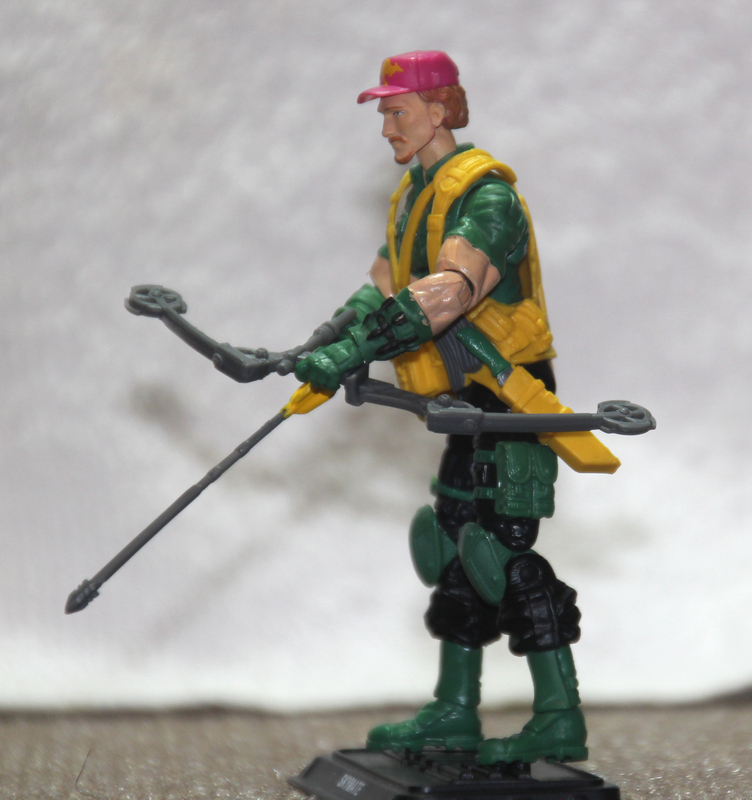 He’s by no means a household name (except around here thanks to loyal reader and commenter from Australia who adopted that codename as his user name), but Hasbro made an interesting figure back in the day and the GIJCC was able to make a great modern figure based on the pink-hatted Australian SAS commando. Like Cloudburst, the GIJCC combined parts from quite a few different figures to make Skymate and his look is quite cohesive despite being made up of several different figures. The legs come from two very different versions of the same character. The lower legs and kneepads come from Retaliation G.I. Joe Ninja Snake Eyes while the upper legs come from Pursuit of Cobra Desert Battle Snake Eyes II. Though the overall aesthetics of each figure are very different, the parts from their legs work surprisingly well together. My favorite feature for Skymate is the large kneepads. While I’m sure he’d want to avoid landing on his knees when he’s coming out of the sky, some added knee protection wouldn’t be out of line in his line of work. His torso comes from 25th Anniversary Shipwreck, and though it’s an older piece, it’s still solidly designed and stands in well for Skymate’s original torso. The GIJCC also gave him the Pursuit of Cobra Jungle Assault Duke webgear to make him a little more interesting and I think it’s quite successful. Like with Cloudburst, I appreciate that the webgear looks like it could also be part of the harness system that holds Skymate to his glider. 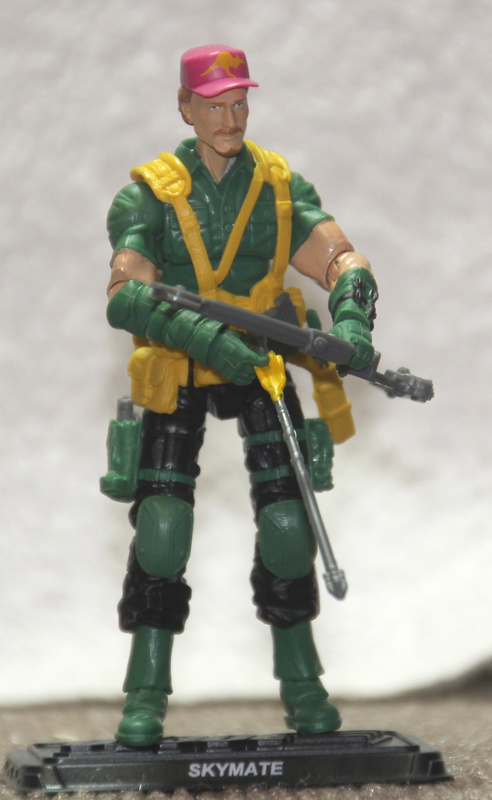 Skymate’s arms come from Pursuit of Cobra Jungle Assault Recondo. They do bulk up Skymate a little, but everything still looks fairly proportional, so I’m okay with it. I think some wirier arms might have been a little more appropriate for Skymate, but that’s just my personal opinion. Topping off the figure, Skymate uses a brand new head. Let me just type that again—Skymate got a new head, and I love that. The GIJCC could have probably gotten away with painting a mustache on the Rise of Cobra alternate Zartan head, but instead, they had the Four Horsemen make a new head for Skymate, one of the more obscure Joe figures out there. I appreciate the attention to detail here, especially since I’m not sure how much reuse potential Skymate’s head actually has. Maybe it could be repurposed for a D.E.F. Mutt, but that’s about the only mustachioed Joe (mustachiJoe?) I can think of that wears a cap. Skymate’s features are fairly angular and he’s got a relatively thin goatee. Up top, he’s wearing a hat. Normally, I’m a little disappointed by static hats, but I kind of like it on Skymate for some reason. There’s a lot of character in this face sculpt and I’m glad that Skymate is kind of a blank slate to me because it’s nice to be able to discover Joe characters for myself instead of having years and years of back story to influence my take on the character. He’s got a fairly intense look on his face, and I like that. It makes him look like a serious soldier rather than the stereotypical American view of Australians that’s influenced by Crocodile Dundee and Steve Irwin. Skymate is a solidly designed figure and the GIJCC gave some serious street cred to a fairly obscure Joe figure. Part of why I think Skymate probably wasn’t the most popular Joe back in the day was his fairly bright color scheme. 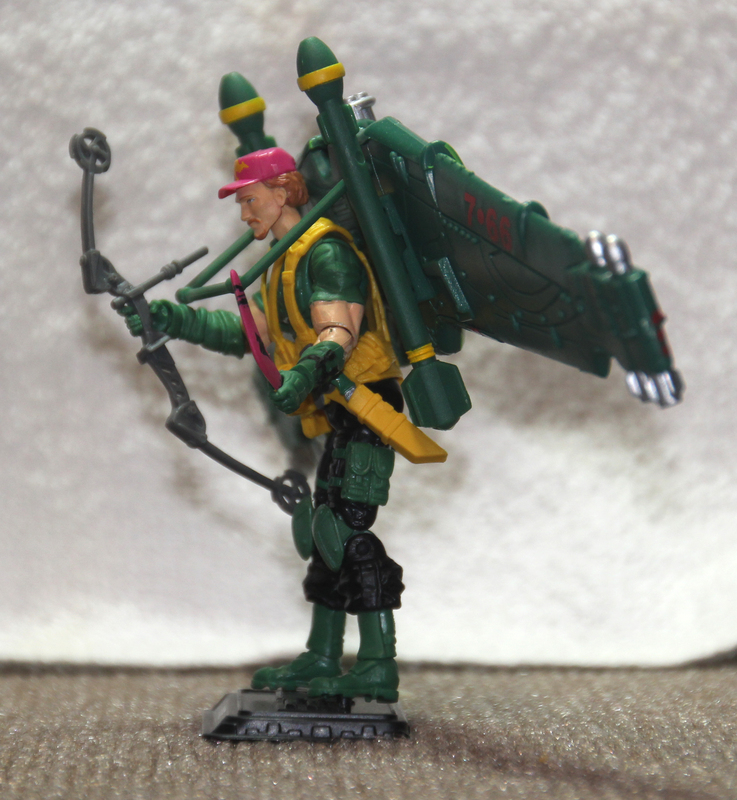 I know that’s a turn off for a lot of people, but those 90s Joes were right in my primary kid years, so I love them and I’m very happy that the GIJCC referenced Skymate’s bright look. From the waist down, Skymate is actually a fairly dark and realistic figure. His pants are black and his boots, kneepads and straps are green. It is a vibrant green, but it is by no means neon. However, up top, Skymate gets quite a bit brighter. His shirt, arm wraps and gloves are all a matching vibrant green and his webgear is yellow. 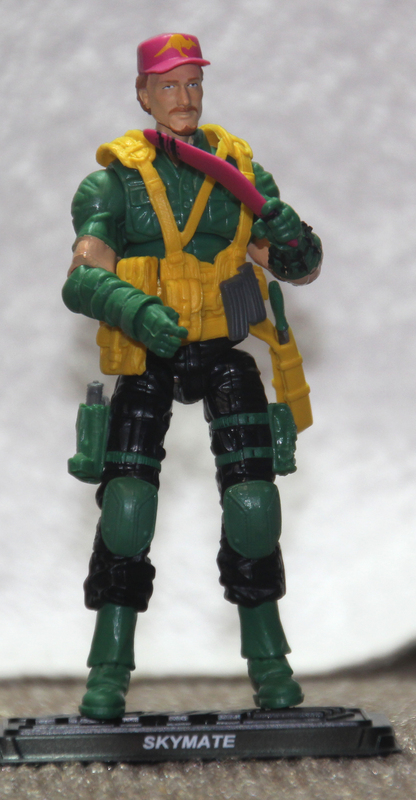 That really brightens up Skymate’s look, but it’s still not eye burningly bright like some of the 90s Joes were. The skin tone on his arms is painted on, but it looks rather thickly applied and that hurts the look just a little. Up top, Skymate’s head is also painted with the same flesh tone paint. His hair is a very light brown and unfortunately, it does look like the paint doesn’t fill the whole on his goatee area, so it makes his already somewhat thin goatee look even thinner. Like back in the day, Skymate is wearing a hot pink hat. However, this time around, the GIJCC also tampoed a kangaroo on it. Thanks to our resident Australian reader, Skymate, we know that this was something that Australian soldiers painted on captured equipment during World War II, and I like that touch here. It’s a neat historical Easter egg, and I appreciate the GIJCC including it. Skymate is still a pretty bright figure, but like the other successful GIJCC updates of so-called Neon 90s figures, they managed to capture the spirit of the brightness without going overboard. Skymate’s accessories are solid, though they’re not quite as good as I would like. I appreciate the GIJCC accurately replicating Skymate’s vintage gear, but without the neat feature of the bow being attachable to the figure, it makes his gear just a tad awkward. Starting off small, Skymate has the same machete that came with Pursuit of Cobra Jungle Assault Duke to fill the sheath on his webgear. I like that piece a lot and I think it also fits well with Skymate’s character. Skymate also gets a pistol to fill the holster on his leg. That means this time around Skymate at least has a firearm, which helps a lot. Skymate’s primary ranged weapon is a bow and arrow. The bow and arrow both come from Pursuit of Cobra Jungle Assault Spirit and I think it’s a great spiritual update to Skymate’s unique bow. However, I wish the GIJCC could have found a way to replicate the original bow’s ability to hook into Skymate’s harness. I think it would have been a little more effective as a weapon if he could be carrying it on his chest while he’s hooked into his glider. Since he’s an Australian, Skymate also carries a boomerang into battle. Like back in the day, it’s a hot pink boomerang, but this time around it’s also got some Aboriginal paint detailing on it as well as another kangaroo. It’s a nice little touch that breaks up all the hot pink and makes it look a little better in his hand. 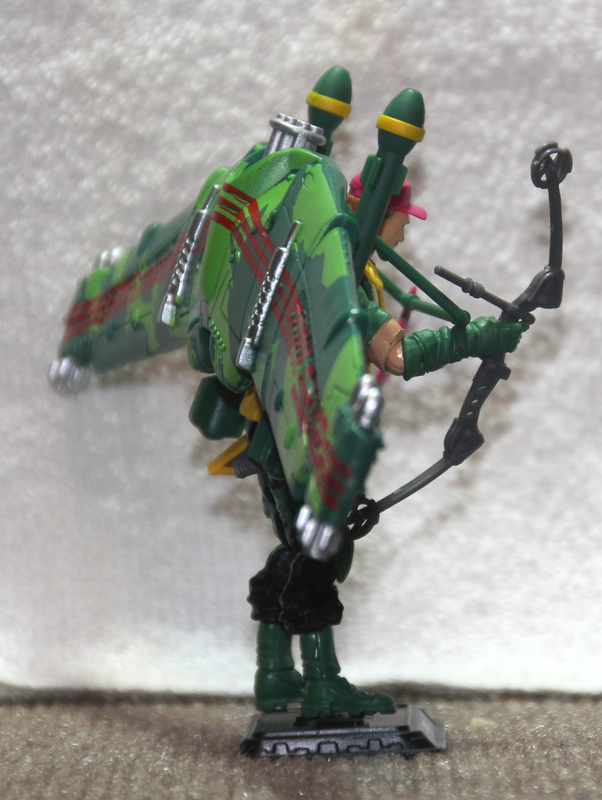 Like his fellow Air Commando, Cloudburst, Skymate also comes with the same glider we first saw back in the SpyTroops days with Barrel Roll. This time, it’s green with a lighter green camouflage pattern on its back. 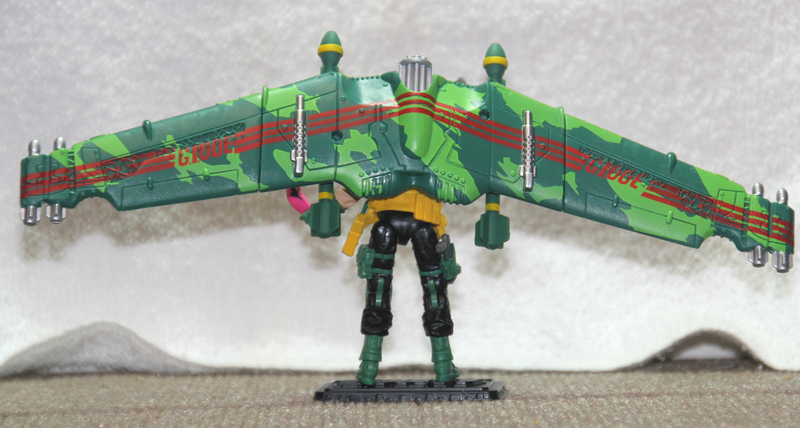 The missiles are green with yellow stripes and the rockets and guns mounted on the glider are silver. There’s also a red “7-66” tampoed on the wings. It’s a sharp looking glider and truthfully, I think Skymate’s version looks just a bit better than Cloudburst’s even though the green isn’t quite as good a camouflage color scheme for someone in the sky. I never thought that Skymate would get a modern version. The Air Commandos were a pretty obscure and rather unpopular subteam. I doubt they were terribly high on anyone’s list for updates. However, the GIJCC did a great job with Skymate and Cloudburst. Skymate captures all the delightful weirdness of the vintage figure but still manages to create a great military action figure. The new head is a great addition and completely unexpected. The gear, while at times not ideal, adds a lot to the figure and while we’ve seen it a lot since Hasbro first released it back in 2003, I really do love the Barrel Roll glider. It’s just a great piece and it fits well with Skymate. The GIJCC did a bang up job at taking a relatively unloved vintage character and make an incredible figure out of him. 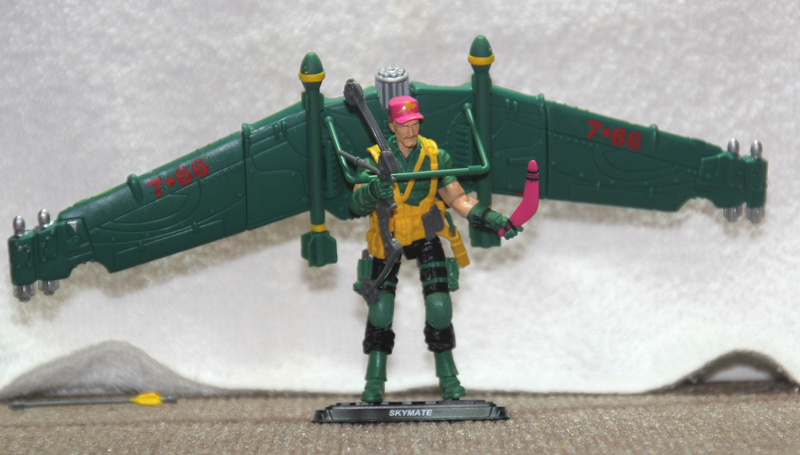 The reason I didn’t have more Air Commandos as a kid was because I only really wanted one glider and the only figure in the line that interested me was Air Devil. That’s my same reasoning with the Battle Copters, too. I only needed one and Interrogator was my favorite of the included figures. 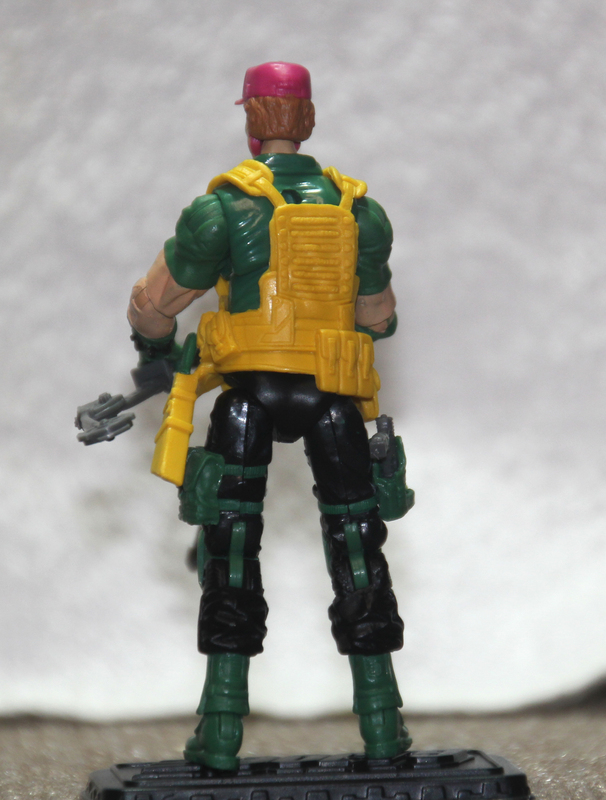 The torso is from the 25th Anniversary Viper, and the lower legs are from Renegades Ripcord. I was surprised he got a modern figure as I thought most fans held him in a lower regard than Crystal ball. His key moments in the DIC series have him wrestle a gator and fight a mutant Ozone. A common misconception about boomerangs is that we all carry them. I wanted most of the gliders and their figures, but I never got them. At the time I had limited money and multiple toy interests, with Joe, hall of fame, super heroes, and others.